Nancy and Benny Arispe received a huge gift Wednesday, Oct. 17 on the eve of their wedding anniversary – a new house. Hurricane Harvey destroyed the family restaurant (Capt. Benny’s), N. Arispe’s business (Nancy’s Beauty Shop), and their home, which was located on the same property as the two businesses in downtown Fulton. The Arispe’s new home, located at 104 S. 2nd St. in Fulton, was rebuilt through the Coastal Bend Disaster Recovery Group (CBDRG) partnering with disaster recovery organizations, including Samaritan’s Purse, the Rockport-Fulton Chamber Foundation, Christian Public Service, Cokeburg, Covenant, and Northridge Presbyterian churches, RV Disaster Corps, Fannie Mae, current CBDRG clients, Pendleton Free Methodist Church, Walmart, and numerous individual volunteers. CBDRG’s Rev. Beth Tatum spoke on behalf of the organization she represents, noting it uses resources from many areas to rebuild and repair houses, based on unmet needs. 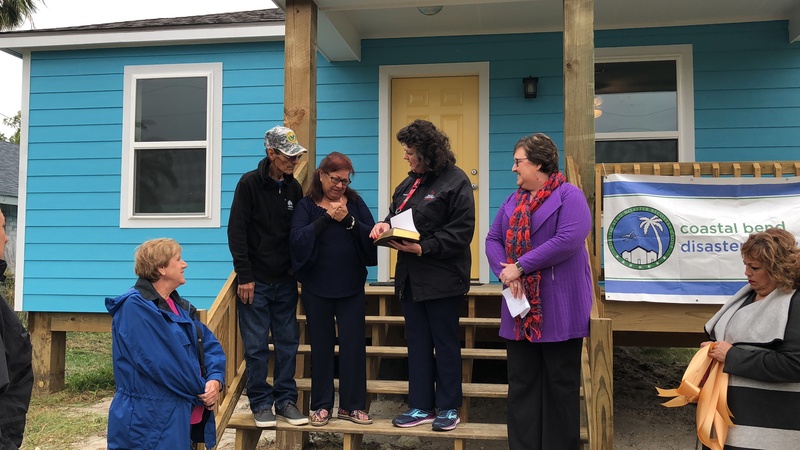 Carolin Perez of the Billy Graham Rapid Response Team said a prayer prior to the official ribbon cutting and handing over of the keys. Perez gave the Arispes a special Bible from the Billy Graham Evangelistic Association, signed by members of that organization. 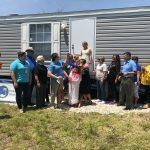 N. Arispe said, “We thank each and every one of you who made this possible,” and then quickly changed focus and asked that everyone pray for residents of Florida who are now experiencing the pain Aransas County residents experienced in the wake of Hurricane Harvey. Rockport-Fulton Chamber of Commerce President/CEO Diane Probst, speaking on behalf of the Rockport-Fulton Chamber Foundation, thanked the CBDRG for their efforts to “stretch the dollars” raised after Harvey, through its partnerships with other organizations, to make homes such as the one built for the Arispes, possible. N. Arispe, recalling the process they went through to be considered for assistance, said she didn’t believe it when she first received the call. B. Arispe asked his wife who the call was from, and encouraged her to call them back. After retrieving the number from her phone, she made the call. The Arispes learned they had in fact been chosen, based on their unmet needs. They lived out of town almost the entire time since the storm made landfall Aug. 25, 2017. They will now move back to Fulton and begin the long process for rebuilding their businesses.